As Heraclitus’s well-known assertion about the impossibility of the same man stepping into the same river twice elegantly articulates, repetition is never absolute. Each replication of an action or an object, however meticulously executed, is necessarily subject to some degree of change. Repetition, paradoxically perhaps, emphasizes rather than erases difference. The repeated forms in Finbar Ward’s exhibition, ‘In Absence’, at Fold Gallery, quietly accentuate both their own peculiarities and those of the basement space for which they were made. 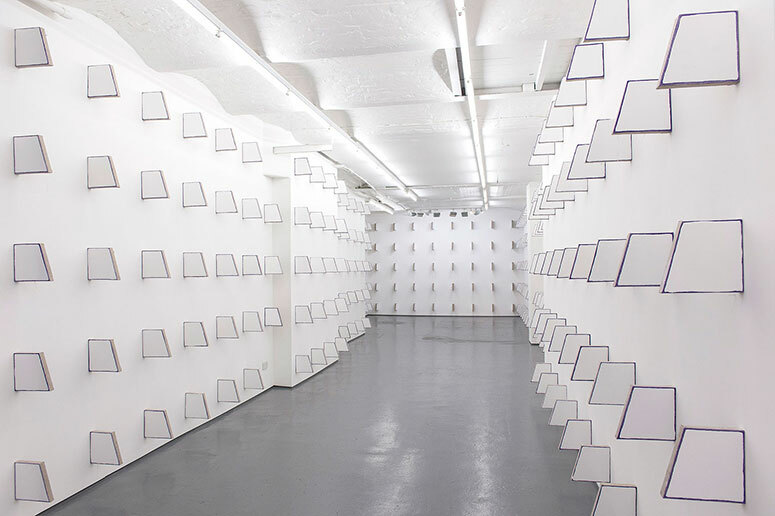 The title work (2016), comprising 300 shaped canvases stretched over asymmetric trapezoidal frames, lines three walls of the gallery in uniform columns and rows. Each support is fixed by its edge, so it juts perpendicularly into the space, giving the impression of being not so much hung on the wall, as slotted into it. It is tempting to imagine unseen ‘other halves’ of each frame projected into the neighbouring spaces, hinting at an infinity of identical adjacent chambers. On the fourth wall, Untitled (Template) (2016), assumes a commanding position in its relative singularity. Its six supports, one significantly deeper than the others (or should that be wider? Edges here become faces as faces become backs), sandwich the negative space – the absence – of a seventh. The hand-painted initials of the artist are visible in this gap – a sly wink, perhaps, at the fallen orthodoxies of originality and authenticity. Multitudinous minimalism, was my first impression as I turned into the length of the gallery: a conflation of profusion and restraint marking a kind of border where opposites collide. The ‘front’ of each support is painted with smooth, reflective white enamel, while a line, both crude and delicate, of cobalt violet oil describes each profile. A near-symmetry, across the elongated space, is denied by the uneven alignment of the panels along one wall – effecting a quivering ripple, which seems in sympathy with an undulating section of the gallery ceiling. The reiterated shape is naggingly familiar: a rudder, some kind of paddle or pedal, half a razor blade, half a roof drawn by a child. The correlation I sought was in the history of painting itself – particularly in the shaped canvases of artists such as Ellsworth Kelly, Kenneth Noland, Richard Tuttle and, specifically, in Robert Mangold’s ‘Attic Series I and II’ (both 1990). (I wonder whether an allusion to the ‘Attic’ paintings, in a basement space, might constitute a subtle joke – though I understand Mangold used ‘Attic’ to mean ‘from Athens’, rather than in its architectural sense). Ward works within, or at least in reference to, a tradition in which paintings declare themselves as objects rather than windows onto illusory representations of reality. On walking through the work, its facture is pointedly visible. Unpainted edges, folds and stray threads of linen, stretcher bars, backboards, staples and screws seem, again, in accord with the gallery ceiling: at the beginning of Fold Gallery’s tenure, suspended tiles were removed to expose a hotchpotch of roughly mortared brick, timber, steel, pipes and cables, now implausibly disguised in their coat of white emulsion. It is in the flipside view, from the end of the gallery, that difference announces itself. The backboards are variously washed with green, white and, in one instance only, yellow. Some are distinguished with anomalous daubs of paint and most were marked with the letter ‘B’ – for a back that was also a front. Heraclitus’s paradox is that a river, though in constant flux, remains the same. In Absence flutters, shifts, eludes and reverses while, at the same time, resolutely retaining its identity as painting.